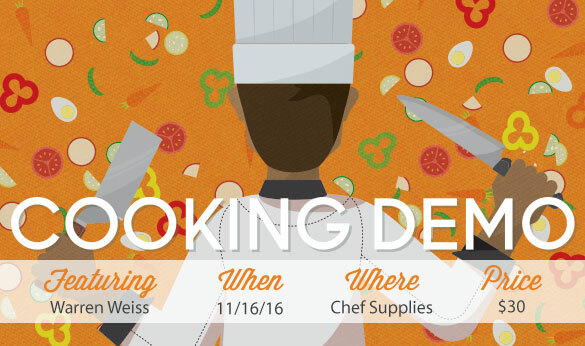 Warren Weiss of Babalu Tacos & Tapas in Knoxville will be here on November 16 to share some of your favorite dishes from Babalu. Call us at 865-225-1545 to claim your spot today! “Babalu Guacamole” on grilled country bread toast points with radish and micro cilantro. Tuna Ceviche with pico de gallo, tequilla and lime juice. Babalu Chop Salad: Romaine Lettuce, tossed with Lime Vinaigrette, Black Beans, Charred Corn, Anaheim Peppers, Tomato, Red Onion, Roasted Pepitas and Cotija. Warren’s “Paella”: Yellow Rice, Black Beans with Chorizo, Shrimp, Fresno Pepper, Green Onion, Avocado and Salsa Roja.